The 2018-19 Lake Tahoe season has been “wet” to say the least. Storm after glorious storm have hammered the Sierra but snow levels have hovered around 7000’ to 7500’. Much of the lower terrain including lake level weren’t in play. And then it happened… the perfect storm. 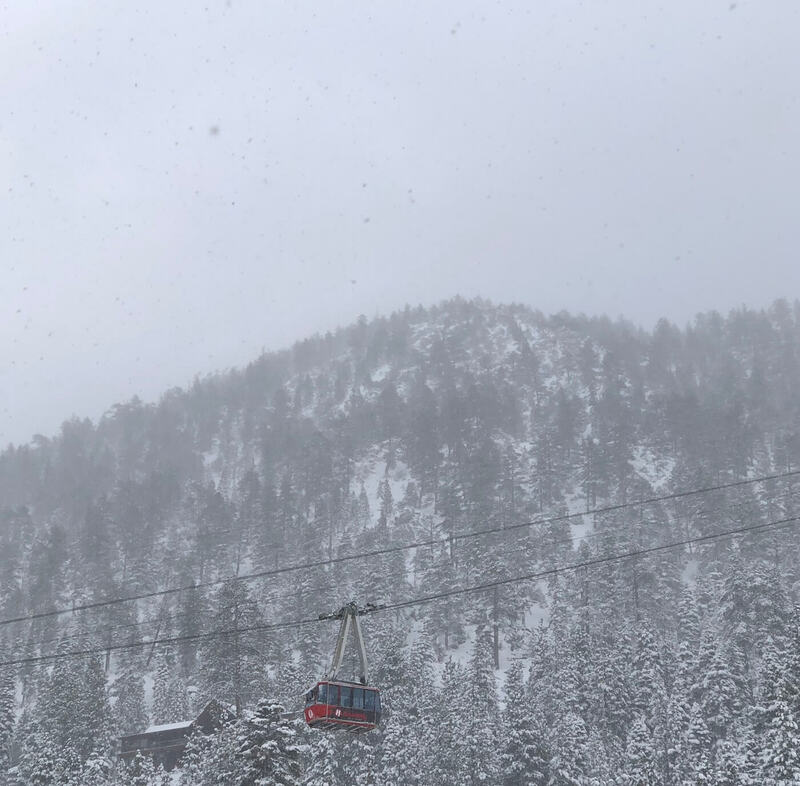 Cold, ample amounts of snowfall, and not a ton of wind for just a few hours descended on Lake Tahoe. A true rarity in the Sierra Nevada. 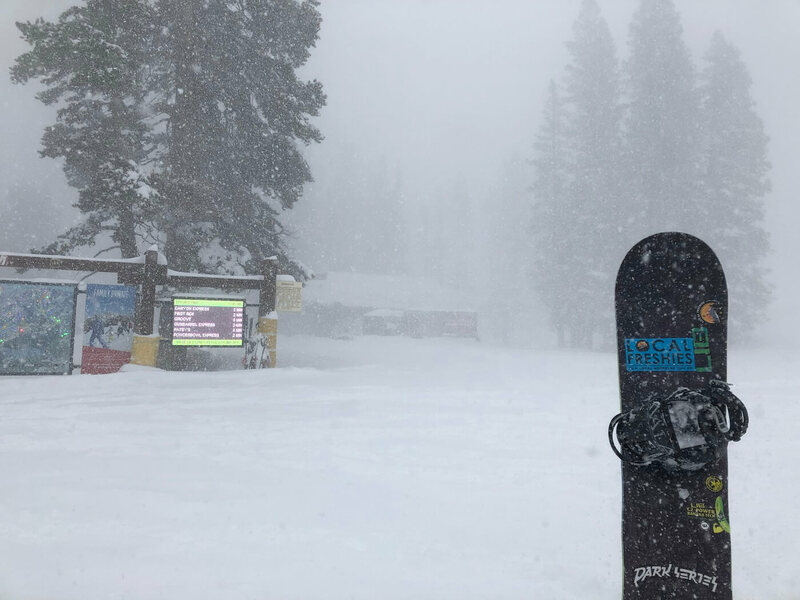 And just like that, February 4th became the best day of the 2018-19 Lake Tahoe ski season. While there were many amazing days in February 2019, one stood out from the rest. Everything aligned to make it the best skiing in years. A day so perfect and so amazing it will go down in infamy as a “you shoulda been there!” First, the snow came in with a fury, shutting down all highways into the Lake Tahoe basin. While we couldn’t make it to Kirkwood or Sierra-at-Tahoe, the positive was no one could make it into town either. This set the stage for something special, but it wasn’t until later just how amazing it was going to be. Arriving at the mountain for first chair, a group of grizzled locals are lacing up their boots while leisurely walking over to Gunbarrel. Will the resort open? If so, how many lifts and for how long? A text message comes through from a friend that Mt. Rose is shut-down. Oh boy! No matter the situation, if we get one run, we’re good. Just like a sign from heaven… Heavenly gives the green-light. Game on! As the lift whooshes up the mountain, we look down at the blank canvas below our feet. Not a single track except one from ski patrol. We yip at the sight of the first people hitting the face. It’s GOOD! Ratcheting up my bindings, now it’s my turn. Dropping down the “Face”, I lean back into a massive heel side turn as the dry snow blasts my face. I can’t hold back the joy and yell out a howl. Bouncing from one side to the next in bottomless cold smoke powder, it’s the best run of the year. I arrive at the bottom and zip back onto the lift with no delay. Rinse and repeat countless times… enjoying backcountry snow inbounds. Un-be-liev-a-ble! After the umpteenth time hitting Gunbarrel, we couldn’t believe our eyes. 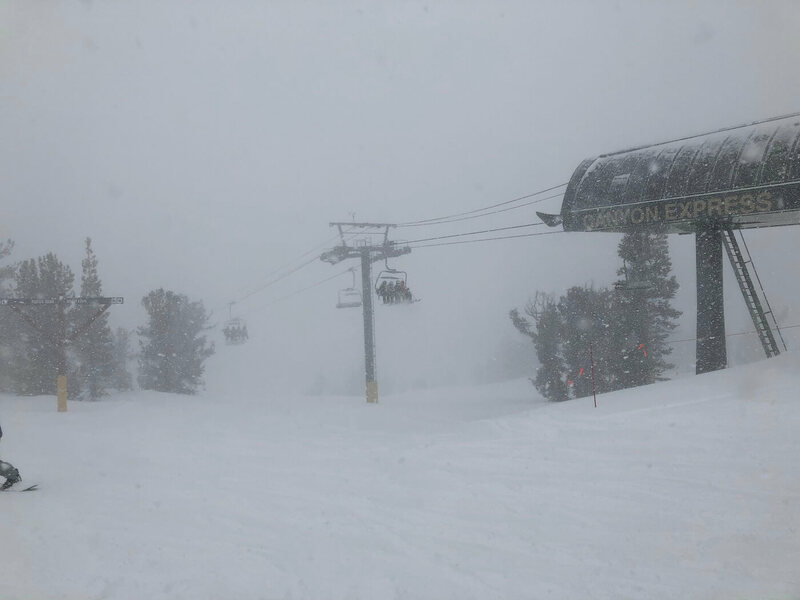 They are going to open Canyon Express! Normally, this would not be possible during a snowstorm but today is special. Quickly heading over to Canyon, I drop into my favorite trees for this part of the mountain (not telling). It’s totally untracked yet again! Staying here, I continue lapping this part of the resort as long as I can until the crowds show up. More people begin to trickle in as there is a little bit of a lull in the storm. 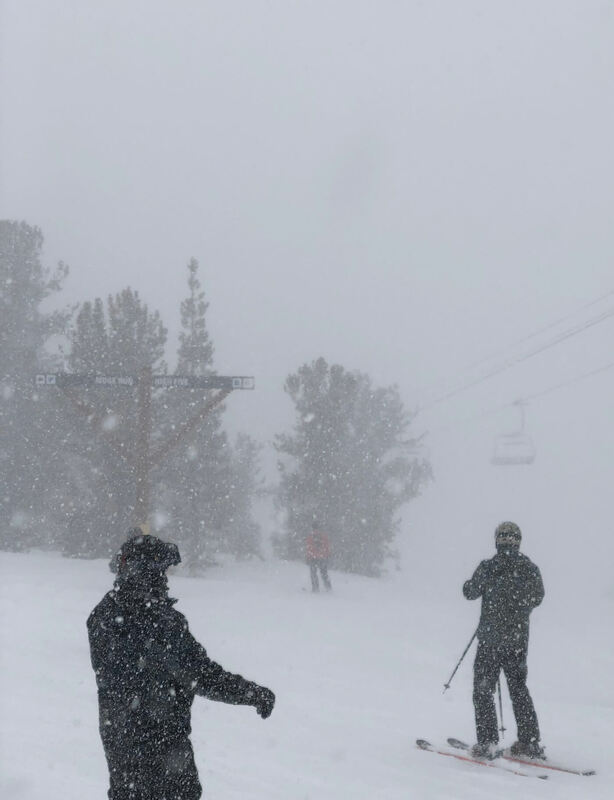 Is this a classic Tahoe “sucker hole?” Someone makes a comment, “I hope it’s a blue bird powder day.” Under my breath I respond, “I hope not.” Just as quickly as I say it, the storm responds with a fury! It’s snowing so heavily you can barely see 50 yards. Not because of the wind, but of how much it’s actually snowing. Every time I drop back into the woods, my tracks and everyone else’s are covered up. Refills! Something that I’ve only seen happen a handful of times in Lake Tahoe. Along with the heavier snowfall, the crowds begin to dwindle. I couldn’t believe my luck. Over and over again, I keep riding knee deep blower snow. Lapping the mountain as much as I could until finally I had to yell… “I Give Up!” I know the snow is stacking up at home and work has to be done. With a deep sigh, I make the journey home. Little did I know that alas tomorrow would be one of the most crowded days of the year. But as my favorite poet once said, “I took the road less traveled and that has made all the difference.” I couldn’t agree more. Give me a cold, snowy windy day over a warm sunny one any time. What does the rest of Febuburied & Miracle March have in store for us? Who knows! Just wondering what kind of goggles you have so that you can see while it is snowing? I’ve been using the Fire Prisms from Oakley. Loving them BIG time… especially how our storms typically have a mix between sun and clouds.